Penny Presses | Find and Trade Pressed Pennies | National Museum of the U.S.A.F. The Air Force Museum is the world s largest and oldest aviation museum, with more than 400 aircraft, missiles, and space capsules on display. It includes many of the last surviving examples of aircraft, and its collection runs from the earliest lighter-than-air craft (like balloons) to the most modern missiles and prototype airplanes. Parking and admission are free. There is only one entrance to the museum, and it places you at the extensive gift shop. 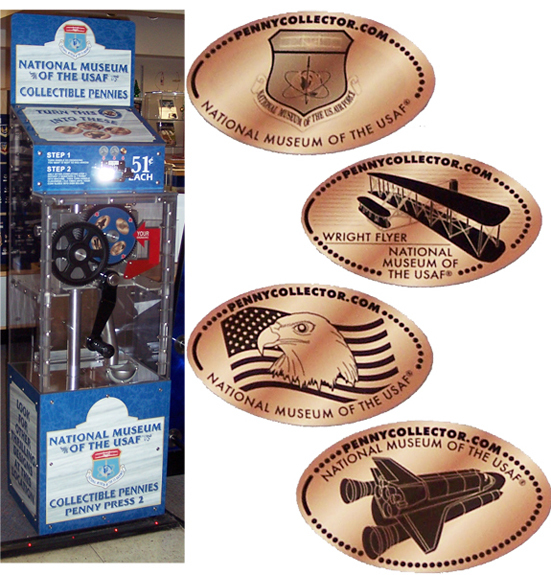 The penny press machine is in the back of the gift shop at the entrance to the exhibit hangars. Although the museum closes at 5PM (Open daily 9 to 5), the gift shop stays open later and you can still press your pennies as long as the gift shop remains open. Machine 2 is located in the Gift Shop. Jaclynn added National Museum of the U.S.A.F. to system.